From today, let this be clear: tech transformation is coming. The opportunities of new technology, done right across the whole of health and social care, are vast. Let’s work together to seize them. Whilst at the very forefront of scientific advancement and research in many areas, our NHS admittedly lags behind somewhat in terms of how to embrace and utilise emerging technologies. Seemingly many of its problems could be solved by the introduction of new and exciting digital implementations, (specifically mobile software applications or ‘apps’) which would make day to day working more efficient and improve patient safety. This is the opinion of recently appointed health and social care secretary Matt Hancock, but is it the right one, and how suitable a candidate is he and his government to implement this digital revolution in the NHS? 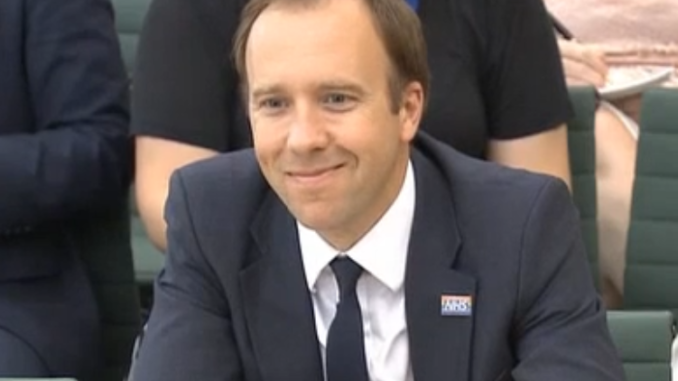 Hancock previously held the office for Culture and Digital so in line with his predecessor’s appetite for technology in the NHS, it seems a logical step for the Prime Minister to seek to transfer his enthusiasm for the subject over to another sphere. At a time of significant underfunding and hardship in our NHS it is also interesting to note that nearly £500m has been ‘found’ and set aside to make these changes. The Matt Hancock app is a fascinating comedy of errors. It is quite fitting, given this Government’s incompetence on digital privacy issues, that our Digital Minister’s app steals a bank of users’ personal photographs, even when permission to access them is denied. This raises serious questions over Hancock’s capability to successfully deliver applications in an area where confidentiality is paramount. Indeed, the Conservatives general track record on cyber security is extremely concerning. Babylon – the promised land? In November 2017 GPatHand was launched. This mobile app, administered by private company Babylon, facilitates virtual consultations and diagnoses for patients, based on rigid algorithmic questions and answers, some of which are potentially dangerous. Errors have included failing to identify the symptoms of heart attack and meningitis. Meanwhile, accepting the app automatically deregisters the patient from their existing practice, meaning patients are without access to their regular GP practice setting – which loses income as a result. The app though has the potential to be extremely profitable for its private provider, especially since it cherry-picks its patients with only those with straightforward or minor conditions permitted to register. It therefore sits well with the overall covert drive to erode public provision by this Conservative government. You have to take into account that humans aren’t perfect either and replacing ‘imperfect’ [clinicians] with ‘imperfect but better’ [eg Babylon’s app] is worth doing. How can #NHS staff have any faith in @MattHancock – when he openly supports unvalidated #HealthTech that compromises #PatientSafety. Days into his job, Hancock is putting more faith in largely untested technology than in NHS staff with years of practical training. It is a slight on the intelligent and hardworking clinicians who, it is safe to say, would never treat meningitis as a heat rash. 30% of symptoms don’t have a clear diagnosis and never will because not all symptoms denote underlying pathology, and in one in three GP consultations there is a significant mental health element, that often does not come out until the patient has presented their physical symptoms as a sort of “ticket of entry”. Symptom-based apps will miss all that and will also both miss diagnoses and over-diagnose. The process of clinical assessment and diagnosis is not as simple as Babylon asserts and requires human thought processes, intuition and emotional empathy to comprehensively assess why someone is feeling ill and what treatments should be offered. Any new application should work alongside, and not seek to replace, the input of a skilled clinician. In May 2017 the NHS was hit by the biggest cyber security breach in its history. Nearly 7000 appointments were cancelled, ambulances diverted and non-critical care put on hold. It was only down to the ingenuity of staff that the ransomware attack wasn’t even more damaging. Interestingly these scenes were not replicated in Wales where firewalls had been kept up to date by a Labour government. Money earmarked for IT upgrades is unsurprisingly sometimes diverted by NHS trusts. When there are so many other areas that require immediate funding, technology naturally becomes the poor relation. Attending to immediate patient need is the priority and technology becomes a ‘nice to have’ and not an essential criterion. Hancock’s policy of making the £20bn of funding dependent on this innovation smacks of either naivety or a deliberate plot to deprive the NHS of much needed funds directed to the most essential areas. The fact that £500m has been earmarked to implement apps almost certainly run by private companies seems strange when in 2014 the government chose not to spend a measly £5.5m on security when it axed a deal with Microsoft. Had the virus protection been renewed and systems upgraded accordingly the whole cyber disaster may have been averted. It is difficult to trust this government to implement brand new initiatives that deal in personal data and are largely untested. Apps used in our NHS can certainly yield a benefit but should be subject to the same rigorous safety testing as any other medical device or treatment approach, when they have the same potential to inflict harm. Of all the sectors that could be a guinea pig for modern non-essential innovation, the NHS should not be at the front of the queue. Amongst the changes Matt Hancock is keen to implement is a smartphone app Medic Bleep to replace that NHS staple the pager (or ‘bleep’). Admittedly this technology is basic and out of date having been widely used by doctors in the NHS since the 1980’s and it is fair to say there is now little appetite for retaining it as a method of communication. However, although attractive, it is also fair to say that in terms of spending priorities replacing pagers is not at the top of the list for clinicians and spending vast sums on creating a replacement in the current climate seems like folly especially when currently wi-fi blackspots in some hospitals could affect performance in critical situations. It is perhaps another example of the health secretary’s fixation on technology as ‘window dressing’ without fully considering the consequences and at the expense of more fundamental basics of NHS care. Like some of the initiatives of his predecessor, Hancock’s ideas seem inappropriately timed and ill thought through. Time will be the judge but the obsession with new technology when there are 100,000 staff vacancies and insufficient beds signals a flawed approach to leadership. It is an indicator of a more general failure to properly understand the complexities and requirements of our NHS that Hancock’s drive towards technological advances has been immediately set out, seemingly without prior or well considered reasoning. Our NHS can ill-afford a ministerial vanity project at a time of crisis. App-based medicine while being presented as the latest advance may ironically be a step back to a two-tier system with a reduced quality of service for those who can’t afford the gold standard. In this brave new world, the rich will still insist on having personal doctors they see face to face. In future this may become a luxury we cannot all afford. To many this preoccupation with new technology may seem like redecorating the house when the roof is leaking. Making the apparent £20bn funding announcement conditional on successful implementation of new technologies means the NHS is once again being held to ransom, but this time by a Conservative on an ego trip who is failing to grasp the blindingly obvious issues in the service. Namely that it is workforce planning and recruitment, better working conditions, increased resource and funding that will save our NHS, and not the headline-grabbing technology it now seeks to employ. Thank you Samantha. See photographic exhibition ‘How Come We Didn’t Know?’ on tour, about the corporate take over of the NHS, now revised with panel on Babylon. Available to help your campaign see http://www.hackneykeepournhspublic.org/exhibition-how-come-we-didnt-know.html . Up in Enfield till 31st August.